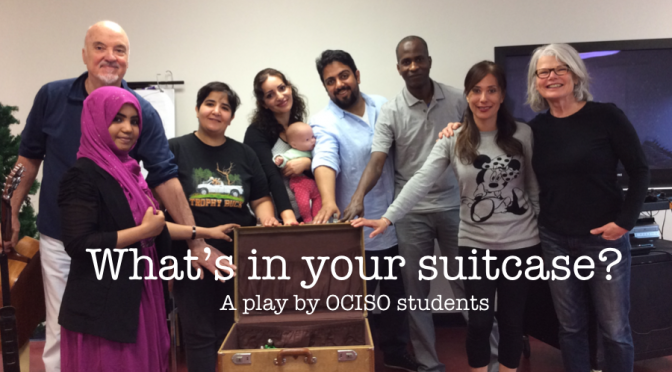 Can theatre help newcomers to learn English as a second language? As volunteers with the weekly conversation groups for students attending the LINC program at the Ottawa Community Immigrant Services Organization (OCISO), we decided to put this question to the test. For the past two years, students have had the opportunity to join a weekly drama group, rehearse an original play and perform that play in front of an audience. Years ago, when I was a young university student living far from home, I signed up for a beginner’s Latin class. I remember my stomach knotting itself into a bag of pretzels while I waited for the course to start. At the time, I had certain beliefs about my learning abilities, (by “beliefs”, I mean “fears”). A quick glance at my old report cards would show I was an average student in every subject save one: English. Combine that singular skill with an aptitude for daydreaming, a tendency to angst out over assignments, and a mild case of generalized anxiety—et voilà: a scholar-in-training is born. Most people like to chat. It’s pleasant to talk to your family over breakfast, and at work, you might go to the coffee room or water cooler mainly because you hope to bump into someone and have a little chat. These observations are consistent with scientific findings: As far as we know, conversation exists in all cultures (Levinson & Torreira, 2015). It is the most common form of using language and it is, of course, where children acquire their language.